Another successful NMCC SYG Mission comes to an end. 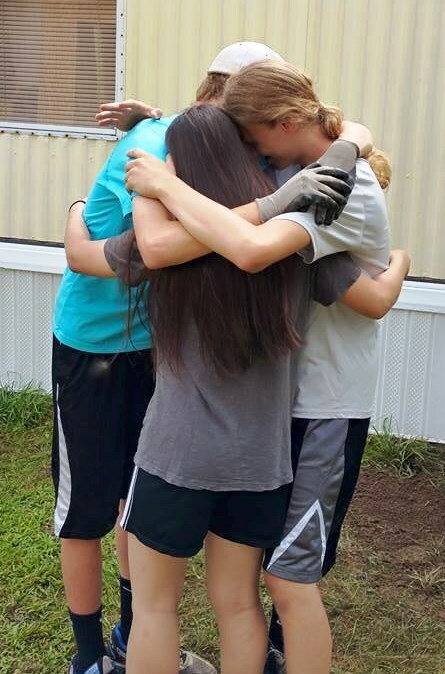 All total, 19 NMCC SYG members and 4 chaperones traveled 1200 miles, built 1 shed, 1 ramp, 2 sets of stairs, installed, handrails, installed skirting for Clara house, installed sub-flooring for Donnie, weeded, planted flowers, built a Cross, washed two cars and loaded the trash trailer. 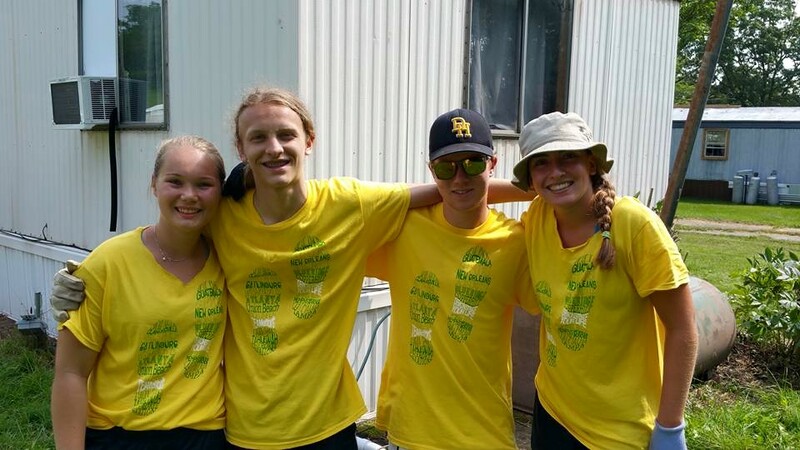 While doing all of these projects, the kids managed to make two new friends Aurora and Bryant, become a more unified SYG, and challenged themselves both physically and spiritually. The morning of our departure. The kids are all packed but we have to clean the rooms, another work day in its own right. The rooms are cleaned and the vans all packed we head up for breakfast and our last good-byes. Having a work site leader like Brooke was a blessing, her ability to quietly lead us in prayer and then command us to build was a perfect balance for our group. Saying good-bye to her was inevitable but sad none the less. 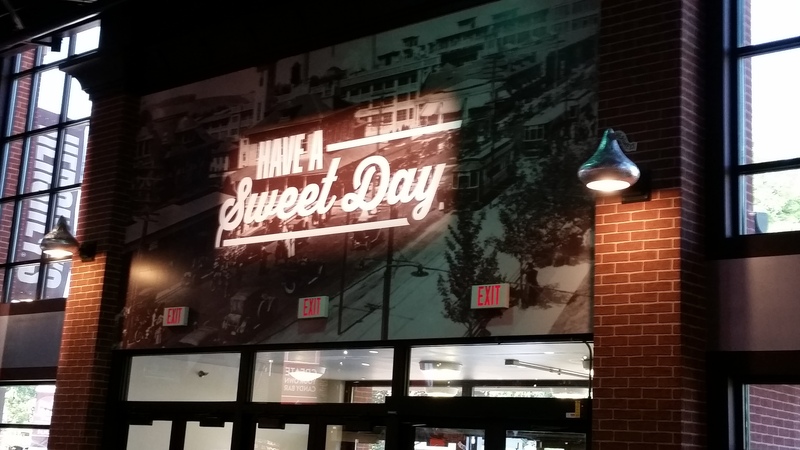 Sadness was tempered by the prospect of chocolate, lots of chocolate all at Hershey Chocolate World. We arrive in Hershey, PA. just in time to grab a quick lunch and then off to become learn how to properly taste chocolate. 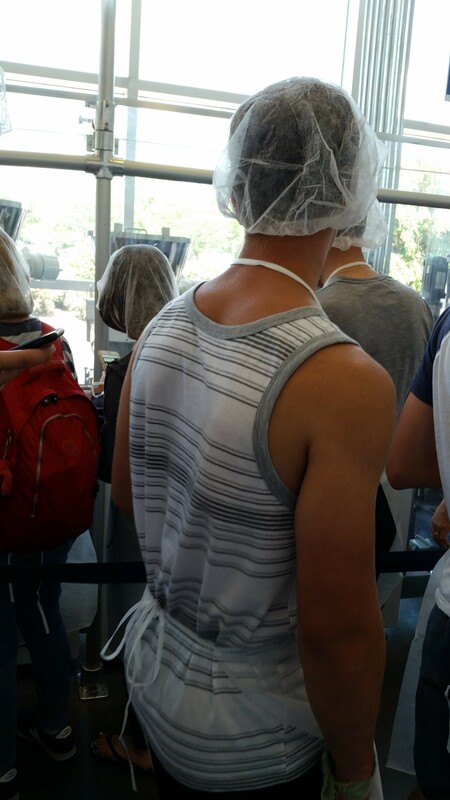 Once certified as a chocolate palateer, it was time to make our own chocolate bar and because it was a “production line”, we had to don an apron and hair net. 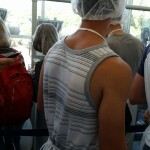 I would question the necessity of a hair net as we saw a person wearing a beard net but there was no requirement for arm pit nets???? We then ended with the tour of how to make chocolate and a shopping spree. With lots of chocolate in hand, we loaded the vans and started our journey home. Friday afternoon traffic in the summer made it slow going through PA and with a couple of bathroom breaks we make it home. This Mission Trip appears to be one of Thankfulness, like being thankful for forms and procedures. Without the permission slips and medical release forms (things I was second guessing about), Ian’s trip to the Medi-Express would have been a lot longer. We were in and out of the clinic within an hour, with assurance and some pills to help with the poison ivy. The return back to the work site also needed “medicine” as the trash trailer had arrived and the kids were had most of the trailer already filled. The second set of stairs was completed, weeds from under Clara’s deck were removed and the lock on Donnie’s shed door was being installed. The completion of the shed was official by Ryan M. with the swing of a hammer and driving in the last nail into the door stop. 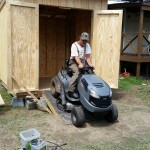 We then gathered around the shed to watch the inaugural drive of the lawn tractor into shed even Donnie was excited. As he drove up the ramp and crossed the threshold, thud! The sound of our mouths dropping as we watched the bottom of the tractor hitting the door frame and getting stuck. Donnie, being a mechanic, did not panic and realized that the tractor could be backed in. With the tractor in full throttle and in reverse, Donnie accelerated up the ramp and nestled the tractor in the center of the shed to the cheers from each of us. Donnie then puts the tractor into gear to test drive it out of the shed, the front wheels clear the door and thud!, bottom of the tractor hit the threshold and the back wheels are spinning off the ground, another Aha! The ramp is too steep to handle the length of the tractor. Resourcefulness kicks in and we realize that an additional 2×6 plank is required across the shed entrance, problem solved, and Ryan M gets another chance to hammer in the last nail. With Thursday being the last work day and it only lasting half a day, after we said our good-byes, we headed to lunch and then to Indian Caverns. The cave was a constant 55o which for some was a bit cold but for others wonderful relief from hot sunny days. 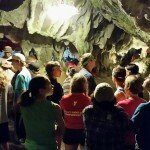 The tour was only 45 minutes but we learned many things from the “musical rock”, to what it means to be in complete darkness, it was a well deserved break from a long work week. With TeamEffort’s closing worship service at 8pm, we were stuck with at least 2hours of nothing to do. A terrifying thought for four adults that need to maintain a sense of control over 19 teens. What else should chaperones do to occupy time but to go to the mall, Logan Valley Mall in Altoona PA. Surprisingly, there were a few that grumbled about our choice until we arrived and they all scurried off (in pairs of course). Some chose to simply sit in the food court and talk, others shopped a little, while others found laser tag and played a round. TeamEffort’s closing ceremony summed up their week long services of the “Demonstrated Life” and for some within the group helped them to better understand what TeamEffort’s Mission is all about. Sounds confusing? Ask your child or wait until Sunday Sept 27 for an explanation. After consolidating the leftover supplies as best we could, the trailer finally arrived. The low sides had no hope of beginning to contain what we needed to take off site. Not to worry. 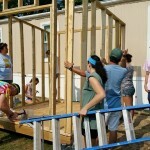 The kids went to work under the leadership of Sam Morin and Chris Hartmann: sides were created out of plywood scraps, doubling the capacity of the trailer, packing every spare space. Donnie joined in using his wheelchair to transport items from the second pile on the other side of his trailer. Slowly the pile disappeared. The TeamEffort duo that picked up the trailer commented that it would take them FOREVER to unpack! With our work done, we did the grand tour, taking photos at the stairs on the 3rd trailer and Donnie’s shed, as we had completed Clara’s stairs and photos the day before. We then all gathered between Donnie and Clara’s homes for a final prayer circle with all of us and Clara, Donnie and Nancy (mother of the 3rd trailer and Bryant, her grandson who lived there (age 8). Pastor Jim asked each of us to say a few words about what the week meant to us. Clara, Donnie and Nancy expressed their gratitude, each in their unique way and Nancy commented that our youth had given her hope for the future. Elizabeth, Erica, Gen and Jade then presented them with the cross. 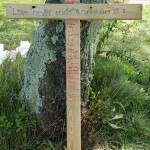 Bryant wanted to know who got to have the cross first! It was finally decided to put it up between Clara’s and Donnie’s home, facing the yard between their homes. Many hugs later, we were off to lunch. Our last breakfast has been had and we start driving to the work site in pouring rain. Some of us may actually be praying that the sun will come out and that we can finish our projects. With a quick stop to Walmart again, to restock our supply of Benadryl and some cheap rain ponchos, we arrive to the site a glimmer of sunshine. Ian’s allergy reaction appears to have flared up again and we are considering whether there was an exposure to poison ivy and after a brief discussion of options we track down the nearest MediExpress and off we go. As I am typing this, Nurse Murphy and Ian are seeing the doctor. Coincidence??? In Mission trips past there was never a nurse chaperone only naive volunteers willing to flirt with disasters. With a nurse present, we have expended almost all band-aids, benadryl and required a visit to a doctor???? In all seriousness, of all things that requires a doctor visit this is an easy one and Mrs Murphy is a blessing. 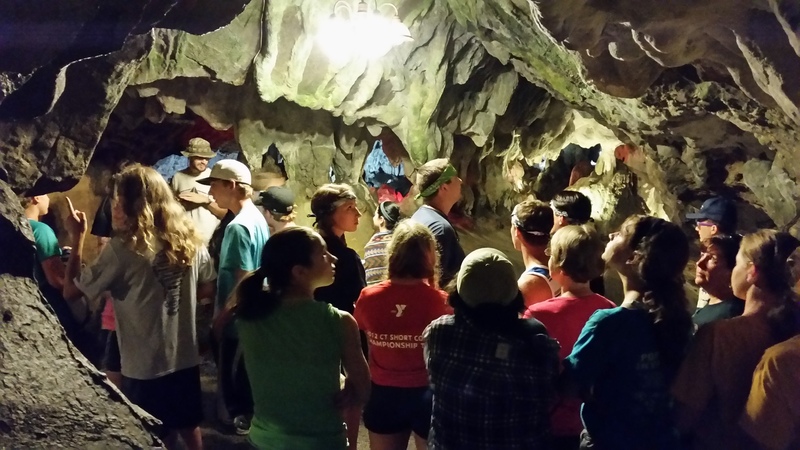 Plans for the rest of the day – Once we complete the work at the site, we will venture out to Indian Caverns for a tour of a cavern and then try and play laser tag at a local amusement park. 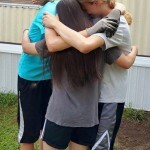 Posting the Mission trip blog has been a challenge this year because of the lack of time to sit down and reflect. TeamEffort is a very well organized group with our schedule starting at 7:30am for breakfast. We then pack our lunches and head to the work site and after an opening devotion, we all get busy with our projects. Weather all week has been terrific; minimal clouds, cool in the morning, and then temperatures in the low 90’s for the afternoons. Our free time in the afternoon has been taken up with Walmart and ice cream, followed by dinner, showers, TeamEffort Worship services and then SYG meetings. The long days and hard work has made writing the blog at midnight a bit difficult and the lack of wifi has also been demotivating. Thank goodness for Roberta!! as she has been able to devote some of her time to writing for the blog. When they say you shouldn’t play with guns, airsoft guns that is. In a moment of potential poor decision making, four of the boys (you can guess) convinced me that airsoft guns from Walmart was a good idea (Tuesday’s trip), due to low pellet velocity and high return on investment. Wednesday morning, Ian wakes up with puffy eyes: a clear allergic reaction to the airsoft guns. 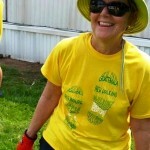 Nurse Murphy and a couple of Benadryls step into action and Ian spends the day sleeping in the van. It was later deduced that Ian bought shampoo and the brand that he purchased was the probable cause of is reaction. Another lesson from mom when she says to pack early so you do not forget anything. Clara’s stairs were completed. Maggie, Emma C and Ben C spent most of the day installing the steps and handrails. A beautiful piece of craftmanship that showed Maggie that power tools are easy to use and Emma C learned that she can use a hammer. Jade, Erica and Elizabeth finished the skirting around Clara’s home and then moved on to washing the cars for Donnie and Clara. As with all carwashing activities, a small water fight broke out. Ryan and Ryland were determined to finish the shed by quitting time yesterday and became even more determined when the all the plywood for the roof was installed. Lunchtime quickly and only half of the exterior walls were in place, Ryan and Ryland take a 5 minute break for water and continue on and by mid afternoon it is time for roofing. Emma S, Kelly, Erik, Christian and Pastor Jim finish building the ramp for the shed and after a lot of digging a trench to secure the ramp is made and the ramp is put into place. 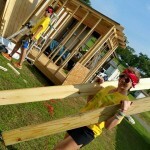 Wednesday afternoon had the added surprise from another TeamEffort Church that did a drive-by construction help. 10 of their youth walked over helped do some roofing and worked on another set of stairs but then 30 minutes later walked away. Today’s plan was to finish Clara’s back stairs, put up all of the walls in the shed and maybe the roof, finish the skirt around Clara’s home, finish weeding the perimeter of the trailer requiring back stairs, finish the floor repair inside Donny’s home and decorate Clara’s deck with the flowers we purchased. How did we do? 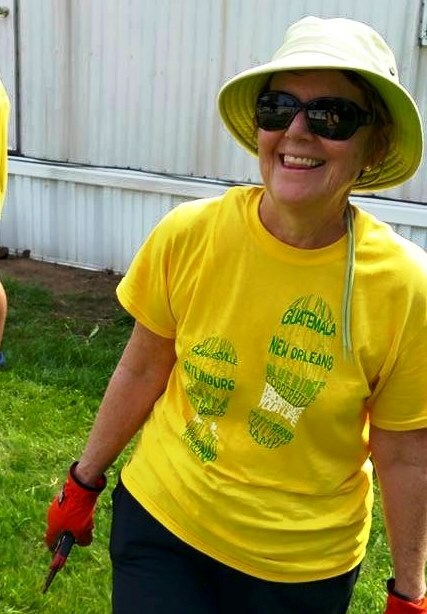 I had brought my gardening tools including a claw to dig out grass and some clippers to take care of the overgrown bushes and weeds at the end of the trailer. When we arrived the older son was cutting the grass and when his mother discovered we were taking care of her weeds around the entire house, she sent out the same son to pick up the yard waste and other items I discovered in the weeds. I had a nice visit with him, learning his name was Christian, going into the 9th grade, and who liked youth group and scouting. Plus he was very helpful pick up the yard and then went in the house to get us popsicles. Talk about motivation! The spiders continued, Emma still sprinting and then along came a small garter snake – apparently everyone wasn’t as thrilled as I was for his visit. I think we named him Chuck. The weeding team finished up the job and all were quickly reassigned to building the ramp for the shed at Donnie’s house. They were thrilled as that meant working in the shade and BUILDING something. At this point Clara was anxious to see about her flowers. I gave her a preview when we arrived so we carried them to her deck and got to work. She let me know she’d never been successful growing flower except for some very fragrant ones on both sides of her shed. But her neighbor had come by with the lawn mower and mowed them down so that was the end of her garden. So we focused on what we had to work with, how to take care of them (deadheading watering, fertilizing, sun or shade) and then set about trimming the spent flowers and dried leaves, arranging them around the deck and now that she finally had a railing there several options to consider. We stopped for a quick visit inside to meet her cats. After agreeing on what old pots we were going to dispose of, we found some fertilizer in the shed and watered the plants. At that point, we both needed to cool off after we agreed the new railings and stairs completed the day before and the flowers made it very welcoming. A sentence that was supposed to be posted yesterday. Due a variety of reasons, Kailey P needed to drop out of this year’s journey. A last minute decision that surprised and disappointed all of us but we respect her decision and give her a shout-out because her smile and presence has been missed. One of the problems with Mission trips is that groups like us have limited experience in doing some of the projects that we have been asked to do. Or it could be that when building a shed or building steps to the back door, actual measurements are really needed. We have had a couple of Aha! moments during these projects. When we decide how to build the four walls, we build the four walls and then realize that we did no account for the width of the wood; requiring us to make a couple of adjustments. Things always work out in the end and with a few extra cuts and a couple more nails the projects continue on while the kids become more experienced. The shed is more than half way built. All the walls were built on Monday, so with eagerness they were hammered into place first thing in the morning. We all took a step back and realized that one of the walls was 2” short and that was the reason why the shed looked crooked (Aha). Pastor Jim, Ryan and Chris worked for the next couple of hours to remedy that situation before other parts of the shed could be built. Ben continues to design and build stairs for the back entrance into Clara’s house. One of the difficulties to building the stairs has been the need to not block the access to the water meter door. With the help from Clare, Maggie and Ryland, holes were soon dug and the posts were set. Aligning the risers into position, we quickly realized that posts were too far apart and the cement was already hardened (Aha! ), but with a quick discussion the step entrance to Clara’s house evolved to a 5 step entrance. Genevieve, Emma C, Jade, Erica, Elizabeth and Roberta spent their morning installing spindles on two other sets of stairs, one set requiring they loosen one end of their spindles, remove the base riser, move it over 2 inches and then reattach the spindles to correct a design issue created by the previous week’s team. McDonalds may have fast food but their wi-fi lacks the speed necessary for downloading pictures. Here are a few Jackie grabbed from Facebook . . . It was a hot but productive day. With tangible projects and the need to complete each project the end of the week, work progressed quickly. Thank Goodness for Karen Murphy, our registered nurse, besides supervising the installation of the vinyl skirting, Mrs. Murphy had her handy-dandy nursing supplies of band-aids and TLC to attend to a wasp sting and some boo-boos due to missing the nail head or poking a finger with a drill bit. By 2:30pm all the kids were hot and sweaty from a day of good physical labor and starting to slow down but there is no better way to invigorate the kids than by offering them a trip to Walmart. In less than 15 minutes the work site was cleaned up and there was new energy within the group. Walmart – a store that they never truly appreciated until they have had a Mission trip room with a refridgerator, some cash in their pockets and no parental supervision. Personal fans, a box fan, T-shirts, shorts, socks, bagel bites, chips, frozen pizzas, ice cream, yogurt, fruit, milk and soda were all purchased. I will not divulge which child bought what items as I will let you figure that out yourself. With their goodies all paid for, we departed for a quick ice cream treat at a local stand before heading off to dinner. TeamEffort presence within the Altoona region not only touches the people that are in but has also been inspiring the local communities. The local churches are now becoming involved and supporting TeamEffort by providing home-cooked dinners once a week. Our dinner was bbq chicken, potato salad and baked beans cooked with love by the Altoona Full Gospel Church. You might think that feeding 150 people would be a time consuming effort but not true, the line moved quickly and everyone but the vegans were eating some delicious chicken. Dessert was another extravaganza; brownies, cupcakes, fruit, cookies, cheesecakes so much to choose from and so little stomach capacity. The night ended with worship (ask your child what they thought), followed by a brief NMCC meeting then some free time of chatting. Skirt installation team – Christian Bray, Elizabeth McCann and Erica Mallon organized this step which requires 2 folks lock the vinyl in place, another to pull the plywood behind it forward so that the 3rd person could nail it in place. VERY SLOW process! 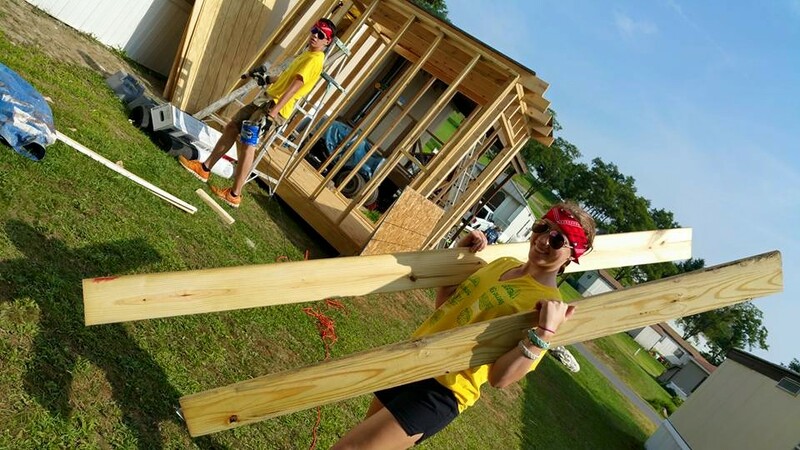 While there was some plywood already in place to get started, a 3rd team of Ben Chasse and Maggie Shea was set up to measure cut the new plywood – you should see Ben and Maggie using the power saw!!! Finally, another team – Erik Matthews and Kelly Cody and later joined by Christian Bray and Emma worked with Ben and Maggie to nail the cut plywood to the studs under the trailer. Yet another team formed to move the access doors to the water system below the trailer: Ryland Chin and Emma Connolly. This involved measuring, cutting (Ryland) and installing the doors by screwing on hinges by Emma. Each time Emma finished a door a cheer went up and we declared her dad would be proud! 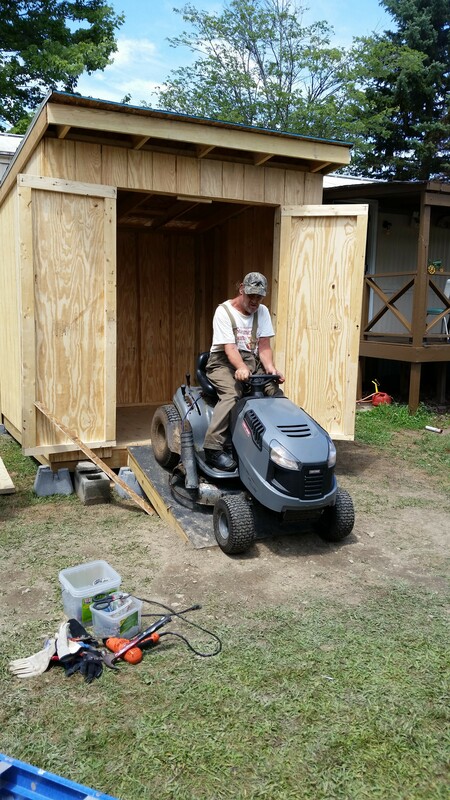 Next door we met Don who needed a new 8×8-foot shed build from scratch. When we arrived there was the front and back and front wall frames were complete but needed adjustments. 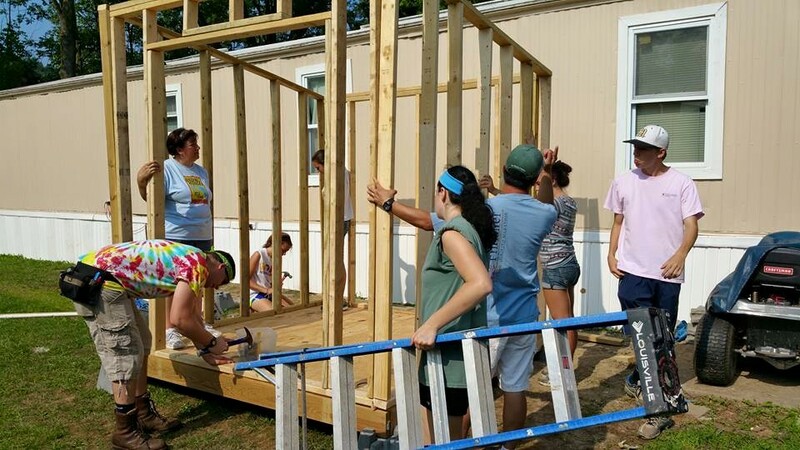 First up, Pastor Jim led a team of Genevieve Garceau, Larissa D’Aniello, Ian Tolis, Sam Morin and Clare Nelson to dig the holes to level out the footings for the shed and then built the frame to fit the footings. From there they added the joists to form the base of the shed. Lots of lessons learned about team work and how easily one small change or adjustment impacts other parts of the building. While the floor was being built, and other team made up of Ryan Murphy and Christian Hartmann tackled the building of 2 side wall frames after fixing the back and front walls. More lessons about measuring and taking into account how the wall fit together further bonded this team! On the backside of Don’s trailer, Elizabeth McCann and Erica Mallon tackled the back stair railing….to be continued tomorrow. Report by our leader, Brooke: “You guys did an awesome job today!” Now off to Wal-Mart and dinner. It is not a school day but the youth needed to be at the Church and ready for travel. With bags filled with snacks, provided by the CE Board (a big THANK YOU!) the kids jumped into the vans at 7:00 and quickly fell asleep. With traffic a non-issue for most of the trip, we arrived at Blue Knob at 3:00 with only 2 stops! With check in at 5:00 pm, we elected to practice our basketball and Frisbee skills and then opted for an early dinner at the restaurant on site. 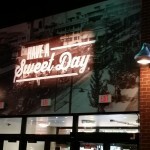 Good thing – the small restaurant and 2 new cooks were rather overwhelmed with the large group from Connecticut for dinner. We eventually all were served our meals, packed up some for later grazing and then headed to the top of the mountain to register and find out where we were staying. Our 3 units are above average accommodations for a mission trip so we quickly settled in and then headed back up the mountain for our worship service at 8:00 pm. 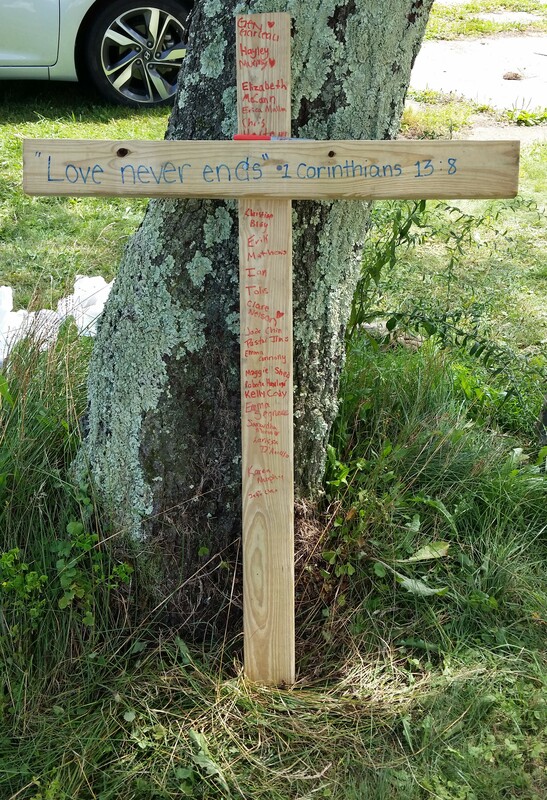 We were welcomed, prayed for, entertained with a staff dance routine, played a game, sung to, introduced to our team leader for the week (Brooke) and then given the scoop on the “the rules” like lights out, buddy system, meals and expected behavior. Following final prayers, Mr. Chin and Pastor Jim retrieved our devotional books and received additional instructions. Upon returning to our condos, we met as planned at Mrs. Hanlon’s unit to debrief on the day and get additional information about Monday’s schedule (we were to be ready to leave at 7:30 am and return after dinner), use of the devotional booklet (yes, we will be using them and encouraged everyone to keep them updated) and then answered a wide variety of questions about our work site, plans to stop at Wal-Mart to get those items we forgot or needed once we confirmed we had refrigerators! Back in our own condos the team leaders answered more questions, worked with each team to figure out the wake up and shower schedules, what to wear, what to bring so that everyone would be at the vans by 7:30 am. Lights out varied by unit, some eating, some getting more sleep than others…but eventually everyone got some. 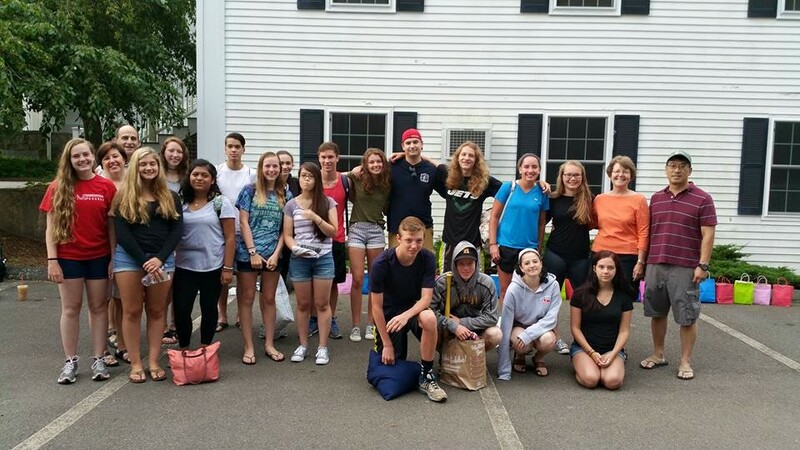 After months of planning, it was time for the Senior Youth Group to finally get ready for traveling to Blue Knob, PA. The Mission trip officially started Saturday afternoon, when the twenty SYG Mission trippers show up to Church to pack the minvan and the two 12-passenger vans under the watchful eyes of the chaperones: Pastor Jim, Roberta Hanlon, Karen Murphy and Jeff Chin. After successfully completing that task, the twenty Mission trippers enjoyed a cookout amongst family, the Board of Deacons and the Christian Ed Board. A Big THANK YOU to Lynn Hidek for providing home baked cookies to help us end the cookout on a sweet note. The NMCC SYG Mission trip is in Blue Knob, Pa. We will be working with TeamEffort to help others in need. The SYG Mission trippers will be traveling to Altoona, Pa, rural town about an hour east of Pittsburgh, PA. We will be working with TeamEffort to help families in need, both physically and spiritually. Due to the lack of industrial presence within the Altoona region, there are limited job opportunities (Penn State is one) and slightly higher poverty level. 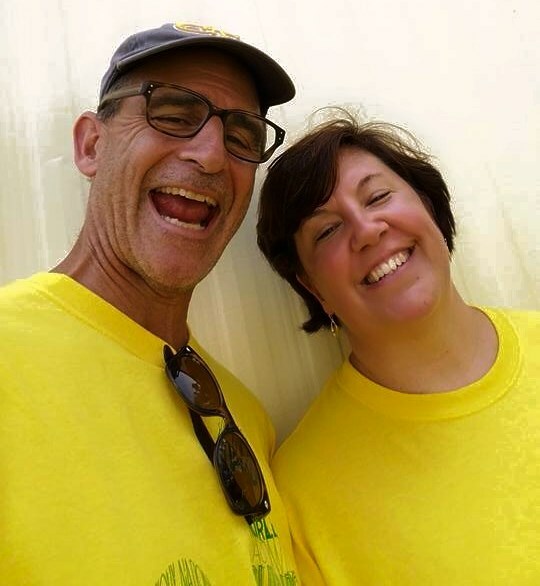 TeamEffort has been working with families in need in this area for the past 6 years and has established their base camp at the Blue Knob Ski Resort.